This is a building in the historic center of the late nineteenth century, now in disuse, which requires full renovation. 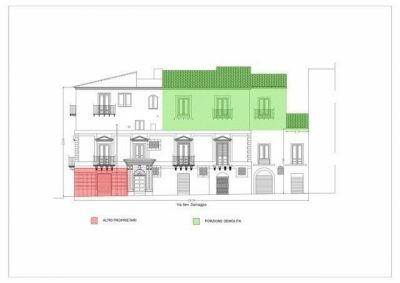 It consists of a ground floor (on the side facing the street Sen. Damaggio), first floor and second floor for a total height of m 14; the back of the building overlooks the vico d'Aleo. A portion of the second floor was demolished and then laid a light covering to protect the lower floors. The plants still retain the original layout with the adjoining rooms, large spaces and high ceilings, and numerous attics and attics. The surface of the actual state is about 1,000.00 square meters - but considering that the heights are up to 5.40 for a total cubic volume of about 4.400.00 m³ (with the exception of the attics), with the restructuring it is possible to realize a much larger floor area. Availability of any private negotiation.